Nephroblastoma or Wilms’ tumor is the most common renal tumor in young children and also a common genitourinary malignancy in children. It develops from the residues of metanephric blastema. This type of tissue usually disappears before the 36th week of gestation. However, if parts of this embryonic tissue remain, it is referred to as nephroblastomatosis. Nephroblastomatosis is considered a tumor precursor and can be found in 40 % of children with Wilms’ tumor. The incidence ratio of Wilms’ tumor is 1 : 10,000. 85 % of patients are usually younger than 6 years. Usually, diagnosis is made in the second or third year of life. Girls are affected slightly more often than boys, and there is a different incidence for children of different ethnicities. For example, the incidence rate in Asia is substantially lower than in European or American children. The genesis of nephroblastoma is much more complex than that of some other malignant tumors in children. About one third of patients with nephroblastoma have mutations of the tumor suppressor gene WT1: a deletion of genetic material on the short arm of chromosome 11. Other factors influencing tumor development are the loss of heterozygosity and genomic imprinting. 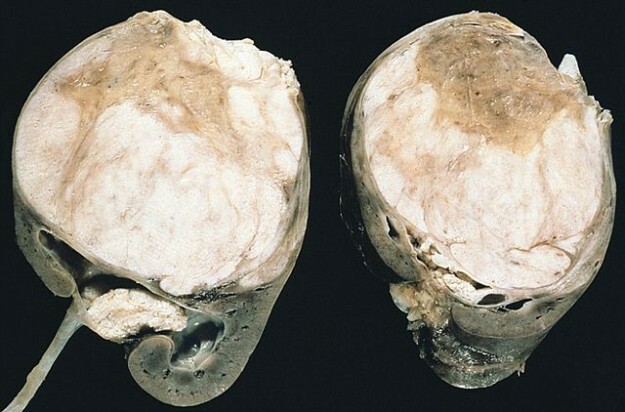 In 10 % of the cases, the tumor is associated with malformations such as the WAGR syndrome (Wilms tumor, aniridia, genitourinary malformations, mental retardation), Denys-Drash syndrome (pseudohermaphroditism, glomerulopathy, Wilms tumor), von Recklinghausen disease (type 1 neurofibromatosis), and Beckwith-Wiedemann syndrome (exomphalos-macroglossia-gigantism (EMG) syndrome). In 5 % of cases, nephroblastoma is bilateral. Metastasis mostly occurs in regional lymph nodes and lungs. Note: Nephroblastoma is associated with syndromes such as WAGR syndrome (Wilms tumor, aniridia, genitourinary malformations, mental retardation), Denys-Drash syndrome, Beckwith-Wiedemann syndrome. For children with these diseases, regular sonographic examinations every three months are indicated. The histological classification according to the SIOP (International Society of Pediatric Oncology) of 2002 distinguishes three groups of different degrees of malignancy. 80 % of cases can be classified as intermediate malignancy, i.e., the standard histological finding. 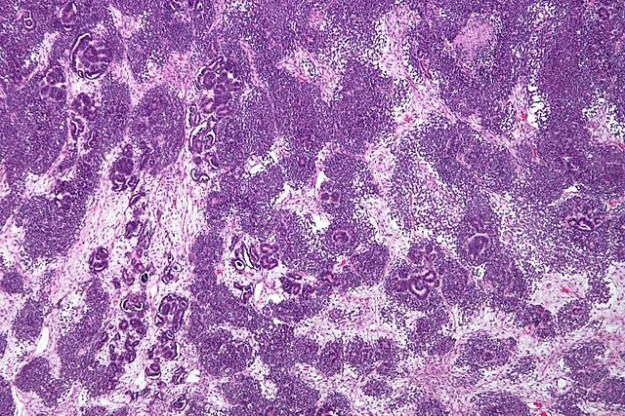 Typically, there is blastema present in the tumor, consisting of clusters of cells with hyperchromatic ovoid nuclei. Within the blastema, different structures can be observed, including rosettes, tubules, and pseudo-glomerular structures. Approximately 10 % of nephroblastoma are discovered only incidentally during a check-up because they are mostly asymptomatic. Using sonography, CT or MRI scans, the dimensions of the tumor can be displayed and lymph node metastases can be detected. Also, a thrombus in the inferior vena cava can often be detected due to cone-shaped in-growths of the tumor into the vessels. A urogram typically reveals that the tumor is spreading into the pyelocaliceal system. Imaging of the second kidney before surgery is crucial since single or bilateral kidney tumors must be excluded. Note: A biopsy is not indicated because of risk of tumor cell seeding. Specific tumor markers do not exist for nephroblastoma. But the determination of catecholamine degradation products in serum may be useful in some cases to distinguish possible neuroblastoma.Thus, urinalysis and urine catecholamine levels of vanillylmandelic acid and homovanillic acid should be measured. Stage I: Tumor is limited to the kidney and is completely resectable. 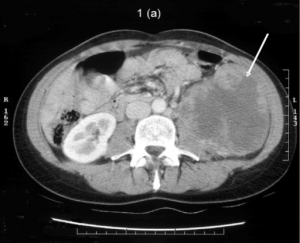 Stage II: Tumor extends beyond the kidney but is completely resectable. Stage III: Tumor resection only partially possible, or lymph nodes are affected. Stage IV: Hematogenous metastases can be detected. Stage V: The nephroblastoma is bilateral. Treatment of nephroblastoma depends on the stage of the disease, histological subtype, and age of the child. Without treatment, the disease results in the death of the patient. Surgical removal of the tumor always involves risk of rupturing the tumor and seeding into the abdomen, with subsequent worse prognosis. Therefore, only children under 6 months is surgery the primary mode of treatment. For older children, the reduction of the tumor mass using neoadjuvant chemotherapy using agents such as vincristine and actinomycin D is the first step, with the goal of reaching the stage I before surgery. For tumor patients with stage III or higher, radiation therapy becomes necessary. Radiation is done to the tumor bed after surgery and chemotherapy to eliminate residual disease. In the case of unilateral nephroblastoma, tumor nephrectomy is the next step. Prognosis is very good. The 5-year survival rate is 80 %; for stage I patients, it is even lower at 90 %. During on-going treatment, it is important to be aware of the possible presence of sinusoidal obstruction syndrome (formerly called veno-occlusive disease) affecting the small hepatic veins. It is a common side-effect of the cytostatic drug actinomycin D, which represents the key substance in chemotherapy of nephroblastoma. For follow-up surveillance, abdominal sonography is a suitable method as it avoids further exposure to radiation. To rule out any lung metastases, it is imperative to periodically order x-ray images of the lung. In the long term, special attention has to be paid to any growth disturbances in the skeleton and soft tissues, which could be a possible consequence of radiation. 1. During a regular check-up of a recently born baby, you notice an indolent swelling of the abdomen. The veins seem to be abnormally prominent in the abdominal area. The mother explains that the baby suffers from constipation, to which she had attributed to the swollen abdomen. In an abdominal ultrasound, you detect a large tumor in the right kidney which seems to be penetrating the renal vessels. Which of the following diagnostic tests is NOT indicated? 2. Which malformation syndrome is not associated with nephroblastoma? 3. Which cytostatic substance, frequently used in the chemotherapy of nephroblastoma, can lead to sinusoidal obstruction syndrome (veno-occlusive disease) when an overdose is administered, especially in dystrophic children? M. L. Metzger, J. S. Dome: Current therapy for Wilms’ tumor. In: Oncologist. 2005 Nov-Dec;10(10), S. 815–826. Review.